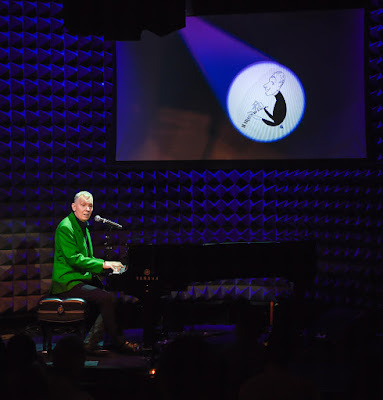 Sometimes all it takes is a seasoned performer and a piano to perfect the art of a cabaret. In John Epperson: The Artist Principally Known as Lypsinka, Epperson takes the stage to sing classics and share stories of his past. Playing Joe's Pub at The Public, Epperson's show is simply stated and effortlessly elegant. For those longing for Lypsinka the character, Epperson leaves her at home. But he tells us that before Lypsinka there was a piano. And that's the premise of the cabaret. Epperson sits behind the piano to perform classics from Sondheim to Epperson himself. The selection of numbers is light, fitting his voice well, even if they happen to be songs for women. Epperson paid homage to the ladies who shaped him and the music that made him. But don't worry, Epperson has a trio of lip syncs to keep the Lypsinka fans happy. Epperson proves why there will never be a lip syncher quite like him. With anecdotes from his days in Mississippi to his epic life in New York, Epperson has stories for days. But it’s his tribute to the trio of ladies that are the centerpiece of the night. Epperson tributes the likes of Betty Comden, Kay Thompson, and Christine Jorgensen by playing their songs, or songs that may have been in their show. Epperson doesn’t need to be flashy. He’s the king of the keys who knows how to offer an old-fashioned cabaret. The night is tightly streamlined that bring a smile to your face. John Epperson may be a pioneer of drag but John Epperson: The Artist Principally Known as Lypsinka proves that he is a well-rounded entertainer. John Epperson: The Artist Principally Known as Lypsinka is a delightful night at Joe’s Pub.